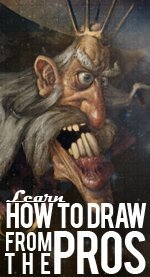 Day or night, learning how to draw a cartoon owl will help your creative skills soar! Follow our simple steps to drawing one of the wisest and most intriguing birds on Earth. For our first step in learning how to draw a cartoon owl, let’s start by drawing some simple shapes for our awesome owl’s head and body – draw a box shape and a large oval shape beneath. Then, draw a large ‘U’ shape in the middle of the body to represent the chest feathers. Now, let’s add some more details. The owl’s ‘ruff’ is the circular formation of feathers around the eyes which actually help our wise buddy to hear and hunt – draw two egg shapes inside the box we drew earlier for the head. Then, draw two smaller egg shapes inside for the eyes. We can also add the feet or claws at this stage – at this stage, they should look a little like clenched fists. What’s that you say? Our next step in learning how to draw a cartoon owl is adding some more features to our feathered friend and make him look more like a wise owl than a grinning frog! Let’s add the ears by drawing two pointed shapes either side of the head. Owls have an awesome sense of hearing which comes in very handy when they’re scouring the forest floor for something tasty to eat. For the eyes, draw two circles inside the egg shapes we drew earlier. In the middle of the eyes, draw a nice pointed beak. We can now take the frog’s smile and turn it into our owl’s chest feathers by continuing the line so we end up with a jagged circlular shape. There, now he looks much more like an owl and a lot less like a frog, wouldn’t you agree? We can also add some more detail to his feet or talons, by adding six sharp claws and some vertical lines. Our wise friend is a legend when it comes to math and likes to perch on a tree branch while working out complicated equations! So, sketch the branch in so it looks as if the owl is holding on to it. We’re almost there! Let’s fininsh off the eyes by drawing some ‘eyelids’ at the top and another smaller circle inside each eye. Add another jagged line in the chest area to give texture to our smart buddy’s chest feathers. To make it look as if the owl’s legs are in the foreground, draw two vertical lines each side of the feet. And, while we’re here, let’s finish off our math expert’s body by drawing a tail at the bottom – make this nice and jaggedy to represent the feathers. Wow! You're almost done learning how to draw a cartoon owl. Your friends will think you’re almost as clever as the awesome owl you’ve just drawn! It’s coloring in time – we’ve gone for brown, but owls come in a wide variety of different shades according to their natural habitat. Some have even got camouflage down to a fine art so they can remain almost invisible to their prey! Color in the body using a darker shade and then use a lighter color for our wise friend’s chest feathers – we can also use this lighter color for the eyelids. Use a really dark color around the eyes to make them really stand out and then do the eyes, beak and talons in the same, light yellow color.Make the owl’s pupils black, remembering to leave a white area to create a realistic highlight. Finally, use a nice dark brown for the tree branch – you can also color in the claws with this. There – all we need to do now is wait for night time and then, our owl will be ready to fly! Twit twoo!